Simplicity is hard to achieve. While its easy to make a simple thing complicated, molding a complicated idea in a simple manner is hard and when someone achieves just that, it is called creativity. A resourceful mind can map out anything unusual into reality. Sometime it receives applause, and at times it goes beyond such mundane forms of praise. 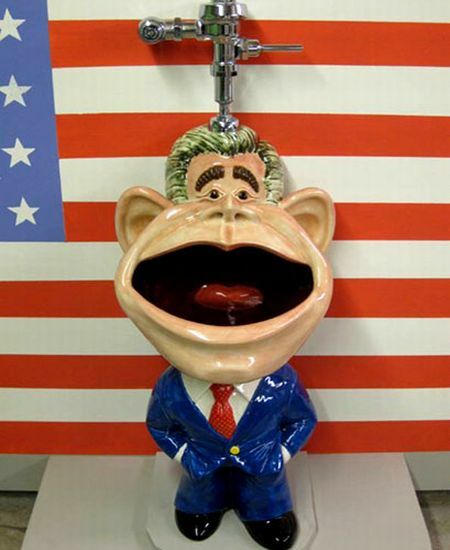 A renowned floral urinal designer, Clark Sorensen, has widened his forte, making a Presidential toilet! Mind it, it ainât for the White House â but is one that bears President George W Bushâs face â not much to be mocked at. The designer asserts that his presidential toilet design, expresses his view of the Presidentâs last eight years of rule. There is a saying that goes âthinking is the enemy of creativity, itâs self-conscious,â but here it seems to be barging into political vicinity â is this Obamaâs new mission in the Oval Office?